After two months with our kids and grandkids in the USA, we returned to Ajijic and spent the remainder of August in our tiny villa here in Mexico. With over 30 inches of rain, the “hills were alive” and looking more like a rain forest. 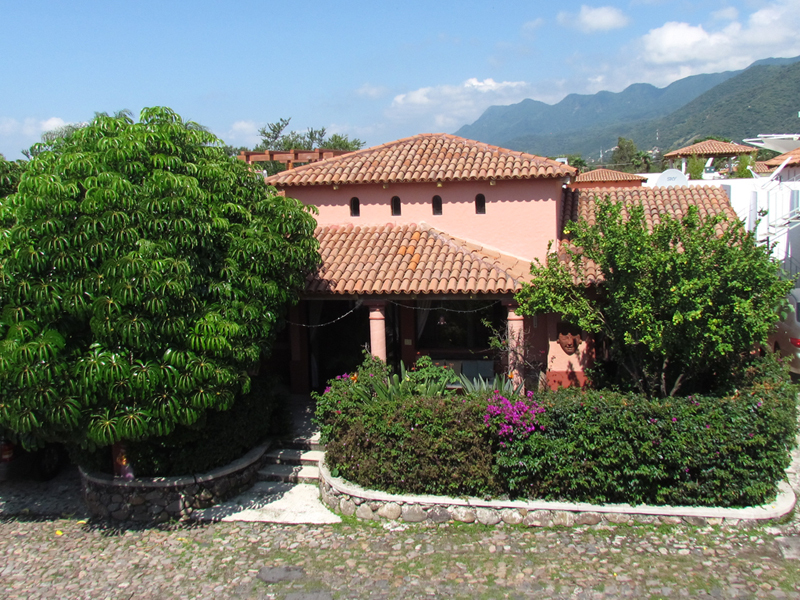 Even our small courtyard had changed—our Mexican lime tree (on the right) was loaded with fresh fruit. 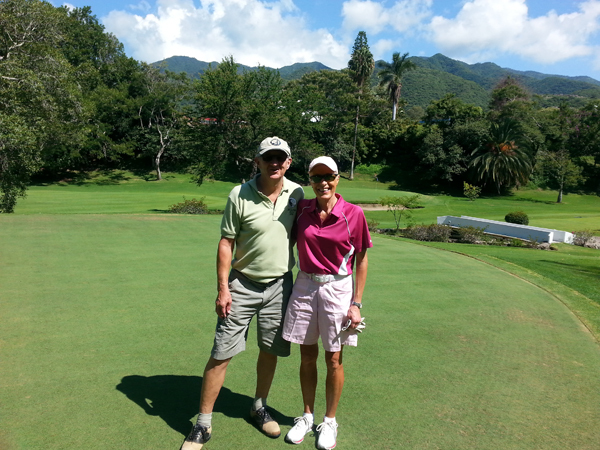 It is estimated that the population of foreign retirees during the summer is 1/8 the size it is in the winter months. And with it came a noticeable, but refreshing, slower pace of life. The first week of August, we finished up our nannies duties. One place we spent a lot of time was watching the kids practicing their swimming skills. 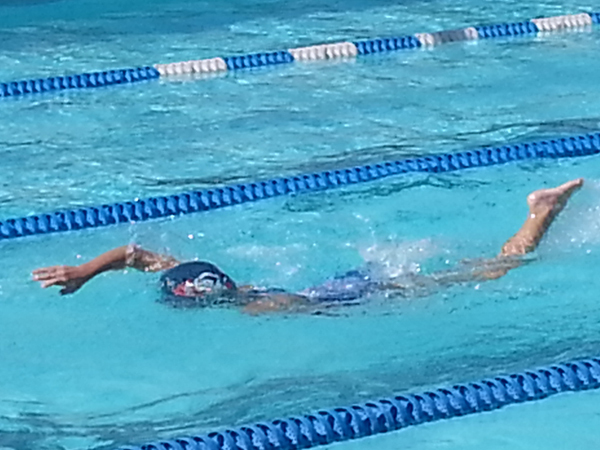 Dakota used these skills to take a few ribbons in an upcoming swim meet. Great neighbors have swimming pools, and better yet, they let you use it most any time you want. 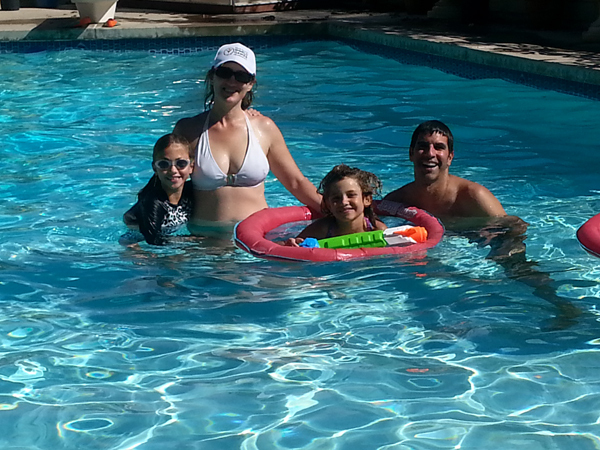 Here we are cooling down on a hot Southern California day enjoying the neighbor's pool. Playing sometimes leads to accidents and Sierra got a scratch on her eye. 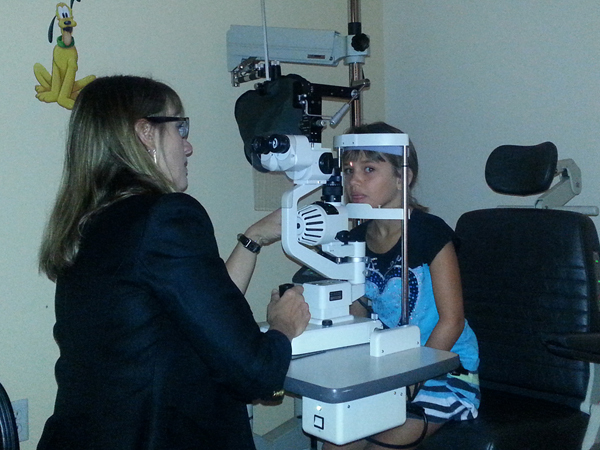 Thank goodness that mommy has access to a fully equipped eye examination room. A couple of days of eye drops and she was back to normal. 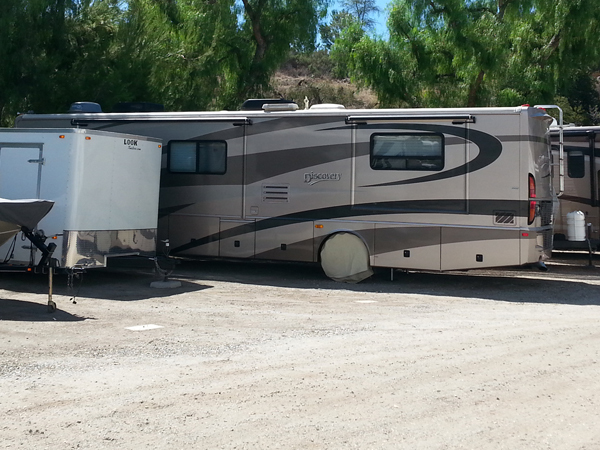 After only three weeks of RVing during the summer of 2015, we stored our rig at a campground where we were staying at and were planning on keeping it there until the summer of 2016 (more on that later). 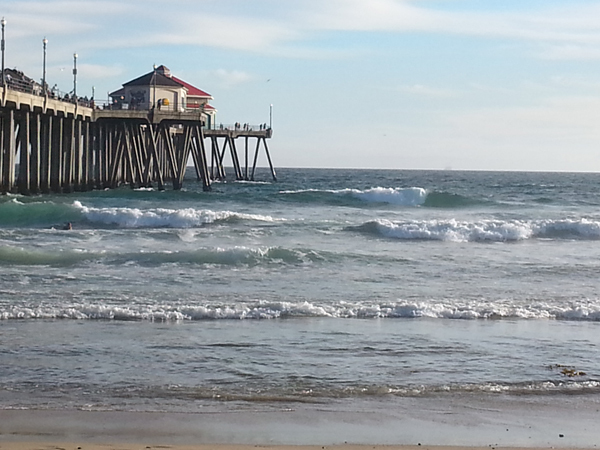 While Carmen and Dakota were attending a live play, Mike took Sierra, Hunter and us to Huntington Beach Pier to enjoy the cool ocean breeze. Mike tried to talk Larry into taking up the sport of surfing, but didn't. 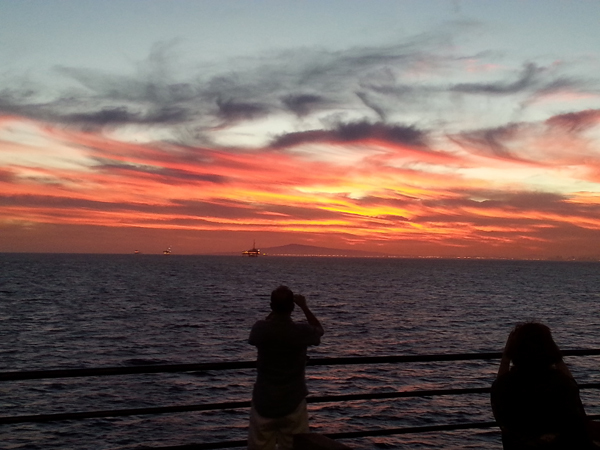 We caught this awesome sunset while dining at Ruby's restaurant on the end of the pier. Off in the distance we could see one of many off-shore oil and gas rigs dotting the landscape of the California coast. 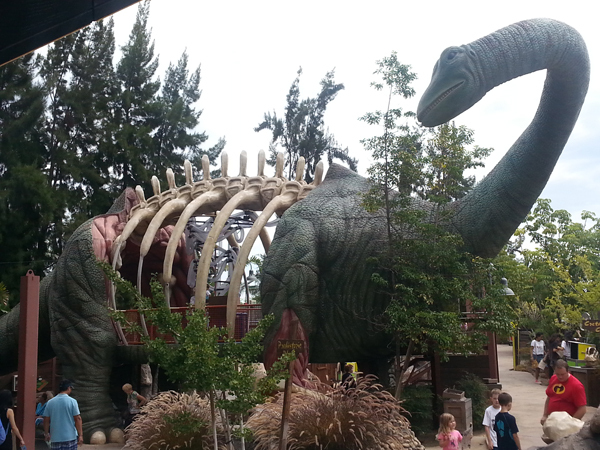 We ended our four-week stay in California after taking the kids to the Discovery Science Center in Santa Ana where Grandma and Hunter enjoyed exploring this life-size Argentinosaurus that stands 70' tall and 110' long. 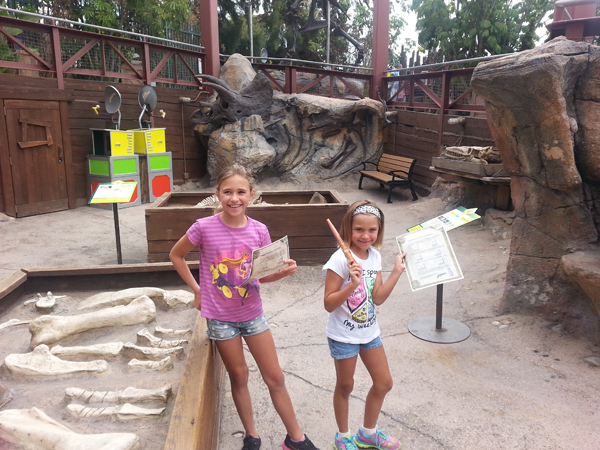 Dakota and Sierra took part in a Dino Quest, the world’s first interactive dinosaur adventure by playing the role of a paleontologists who searched for prehistoric bones of a 95 million year old "Argentine lizard." We flew back to Ajijic on August 7. 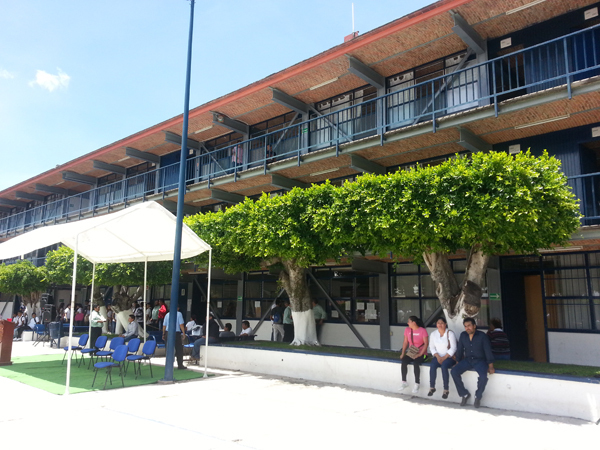 That weekend Larry and Wayne attended the Mexican National Model Train Convention held in Chapala. 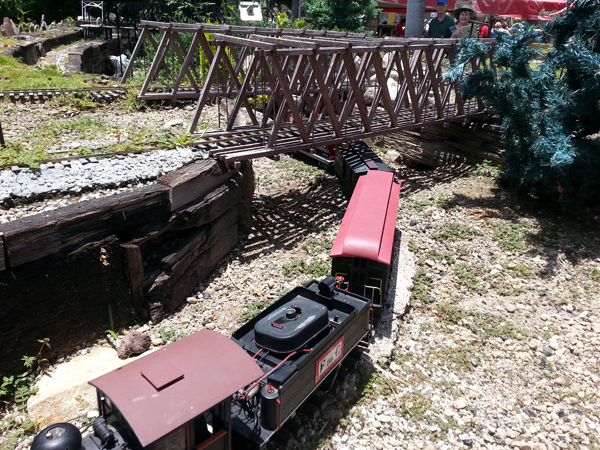 It was filled with model train enthusiasts gathered to display, sell and trade their toys. Glorine struck it rich one night when we took in a local casino. 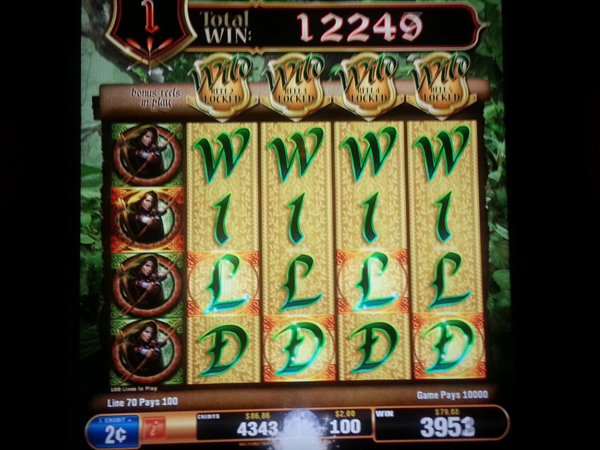 She played Lady Robin Hood and won 12,249 Mexican centavos. With the current exchange rate, this equates to about $7.35 USD. 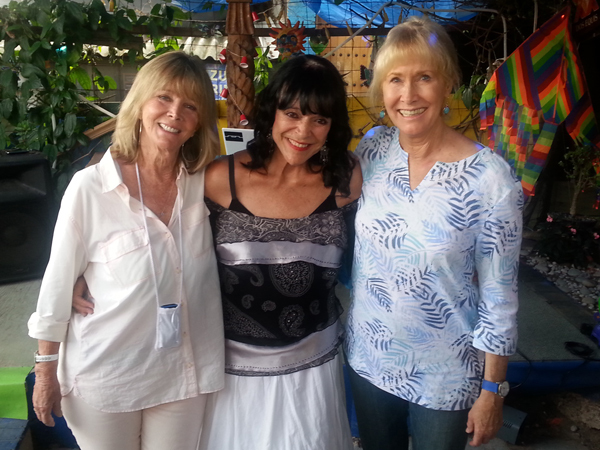 Friends Linda, Lil, and Michele joined us at a Friday night social on our return to Ajijic. These three ladies were guests on the Conan O'Brien show a few years back. Larry got back on the links with friend Remy. With nearly three feet of rain since we left, the fairways of Chula Vista and the mountains surrounding it looked like a rain forest. We spent the evening at Adalita's Restaurant, one of our favorite watering holes at Lakeside and were surprised by the unbelievable makeover. 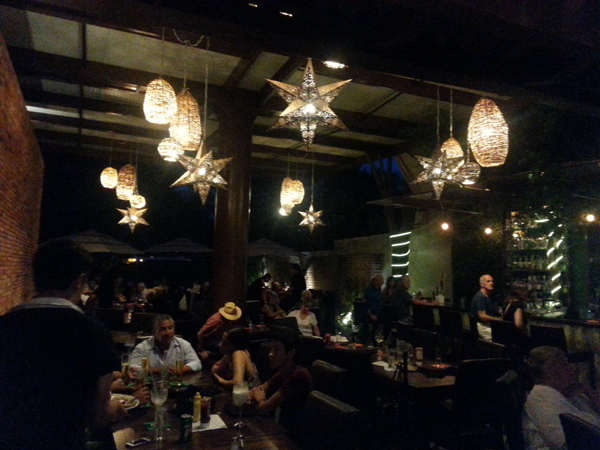 Great food, great music and great prices--it could pass for an LA night club. 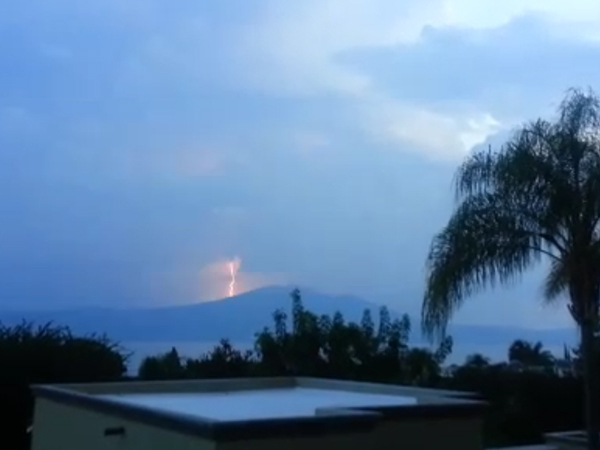 While touring the new home of friends Patty and John, we stood on their patio which had an unbelievable view of Lake Chapala watching the intensity of the lighting in the distant--a sight few snowbirds ever see. 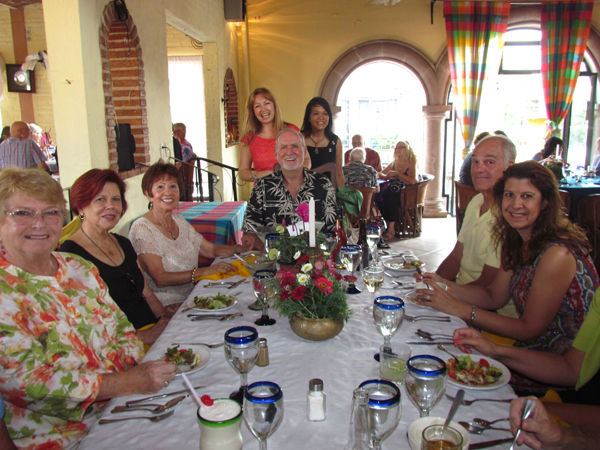 Glorine went back to work on her Career Project with the Lake Chapala Society. She met with school official in Jocotepec and was pleased with their acceptance of incorporating the project at their school. 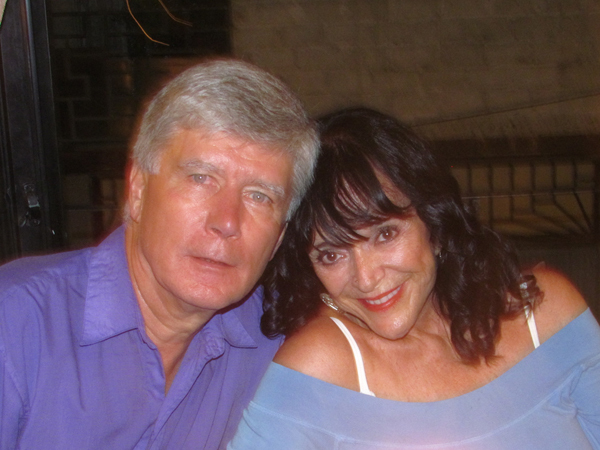 We joined in on the July/August birthday celebration at Manix's Restaurant. Quinton, on the end, was one of several friends to enjoy their birthday celebration. 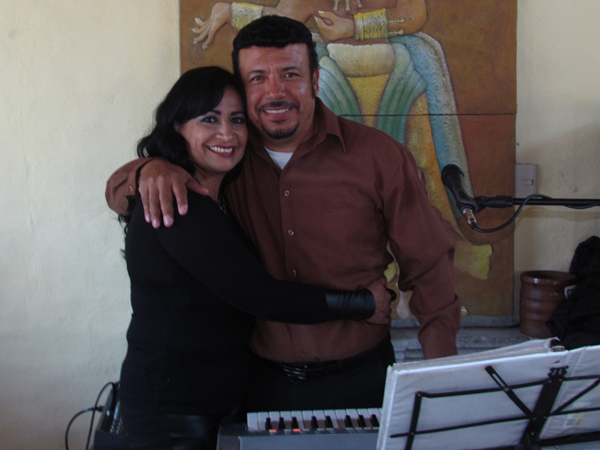 Ricardo and Blanco are regulars at Manix and do one of the best jobs of mixing American music from the 60s and 70s with Latino Cumbia and Salsa music. We got to spend time with friends Lil and Norm, as Lil celebrated her birthday here at Manix. They are quite the fun loving couple.